School is -- thankfully -- out for the summer. Martin Conway is hopeful that he'll never have to go back to All Souls Preparatory. What he wants, more than most things, is just to go to public school. But that wouldn't do for a descendant of the great Martin Mehan. Martin may want to go to Garden State Middle School, but his mother wants him to follow in the footsteps of her father, who worked at the American Embassy in London during WWII, where he advised Very Important Men, which, in turn, made him a Very Important Man. Suddenly I became aware of another person in the room. I sat upright, totally alert, straining to see in the dark. That's when it happened. A boy--small, thin, dressed in mud-brown clothes--leaned out from behind the radio and whispered, "Johnny, will you help me?" Even then, Martin dismisses his visions as dreams. (He's also a bit worried that he might be going crazy, but he's pretty sure he isn't.) But then he starts doing research -- names, places, facts, dates... everything starts to check out. He is learning things from his dreams that he had No Possible Way of knowing beforehand. What he learns will change his life forever -- and will give him the opportunity to change the lives of others. So. 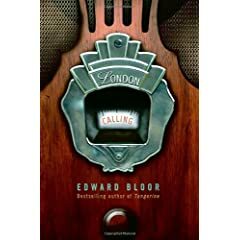 Edward Bloor's books have something in common with the Bad Girls series -- I like the odd numbered ones. I loved Tangerine, hated Crusader, really enjoyed Story Time and felt... meh... about London Calling. There were so many plot lines and issues* that none of them felt fully explored, the coincidences were just too much for me**, and there was a whole lot more Telling than Showing. The Telling could be chalked up to the adult-telling-a-secret-story-from-his-childhood-voice and Big-F-Faith factors in heavily, so the coincidences could be chalked up to Act of God/God's Great Plan, but neither worked for me. That said, I liked the characters (especially Martin's sister and his friend Pinak), I liked the details about London in 1940, I liked the basic premise and I really like the cover art. I might give it a try with the kids who don't usually like historical fiction but need to read it for school. Heck, you could give it to kids who like issue books, too. Or ghost stories. But there are so many components that none of them really stand out. Booklist called it "genre-defying", but it just felt muddled to me. If someone felt differently, please please please chime in with an alternate viewpoint. *Middle school boy unhappy at school; bullies; racism; middle school boy unhappy at home; alcoholism; pressure from parents and family; separated parents; death in the family; ghost story; time travel; deep, dark family secrets; murder; etc. **I'm not talking about the parallels between the family histories. I'm talking about this: Need to get to London with a big antique radio but don't have any money? No problem! My alcoholic father just happens to have a bazillion frequent flyer miles and my bipolar uncle works at the airport as a baggage handler! Yeesh. You'll never guess what they're challenging now.